In a number of countries, decoupling has gone together with real median wage stagnation. In the United States, for instance, annual real median wage growth over the past two decades has been around ½ per cent whereas it has been between 1½ and 2 per cent in countries with similar productivity growth but no decoupling, such as France, Finland and the United Kingdom. Technological progress and the expansion of global value chains have contributed to the decoupling of real median wage growth from productivity growth, but there have been significant differences in firm dynamics across countries. Where real median wage growth has decoupled from labour productivity growth, firms at the technological frontier with low labour shares have pulled away from the remaining firms. The rise of the former firms has been accompanied by high productivity growth and large turnover at the technological frontier, suggesting that it reflects mainly technological dynamism. Public policies and institutions are important determinants of the link between productivity and wages. Investment in skills can ensure that the gains from technological progress are broadly shared with workers because capital is less easily substitutable for high-skilled labour as prices for new technologies fall. At the same time, active labour market policies play a useful role in preserving the labour market attachment and skills of workers who lose their jobs. Competition-friendly product market reforms can promote the transmission of productivity gains to wages by compressing product market rents that tend to accrue to capital but may lead to higher wage inequality by raising productivity and wage dispersion across firms. Where minimum wages are low or employment protection rules are particularly weak for some workers, raising minimum wages or strengthening employment protection for these workers could offset adverse effects of product market reform on wage inequality. However, where minimum wages are binding for a large share of workers and employment protection rules are strict, such measures risk triggering the substitution of capital for labour. also provides descriptive evidence on decoupling for the covered OECD countries based on aggregate data (Schwellnus et al., 2017). The following section summarises the results from OECD country, industry and firm-level studies on the effects of structural trends and policy developments for the transmission of productivity gains to real median wages, with a special emphasis on recent firm dynamics (Berlingieri et al., 2017; Pak and Schwellnus, 2018; Schwellnus et al., 2018). Setting the scene A conceptual framework From an accounting perspective, aggregate decoupling of real median wage growth from labour productivity growth reflects (i) the decoupling of real average wage growth from labour productivity growth and/or (ii) the decoupling of real median wage growth from real average wage growth.1 When real wages are expressed in terms of output prices (as done in this chapter), decoupling of real average wage growth from labour productivity growth amounts to a decline in the labour share, while decoupling of real median wage growth from real average wage growth can be interpreted as a partial measure of wage inequality.2 Aggregate labour share and wage inequality developments can in turn be decomposed into within-firm and between-firm developments (Figure 2.1). For instance, a decline in the aggregate labour share may partly reflect a decline in the average labour share within firms (e.g. an increase in mark-ups in all firms) or a shift in composition towards low-labour-share firms (e.g. an increase in market shares of high-mark-up firms). Similarly, an increase in overall worker-level wage inequality may partly reflect an increase in average wage inequality within firms (e.g. an increase in executive compensation) or an increase in between-firm wage inequality (e.g. the highest-wage firms pulling away from the rest or the lowest-wage firms falling behind). Although technological change, the expansion of global value chains and public policies likely affect aggregate decoupling through all of the above microeconomic channels, only some of them are explored in this chapter. Incomplete coverage of small firms in the firm-level data underlying the labour share analysis precludes a fully-fledged shift-share decomposition. The unavailability of cross-country data that match employees to the firms where they work (matched employer-employee data) makes it impossible to decompose worker-level wage inequality into within-firm and between-firm developments. 1. Previous studies on decoupling that use similar accounting decompositions include Bivens and Mishel (2015), Sharpe and Uguccioni (2017) and Pessoa and van Reenen (2013). 2. Labour productivity is computed real gross value added at factor cost per worker. From an income distribution perspective, it may be desirable to base labour productivity on net rather than gross value added, since only value added net of capital depreciation is available for compensation of workers (Bridgman, 2014; Rognlie, 2015; Cho et al., 2017). However, there is large uncertainty around measures of capital depreciation in the national accounts, because depreciation is unobserved and needs to be imputed. The underlying imputation methods also tend to differ across countries, thus making net value added less internationally comparable than gross value added. Moreover, netting out depreciation can lead to highly cyclical measures of value added, thereby distorting measures of medium-term productivity growth (Schwellnus et al., 2017). The measure of wages used in this paper is computed as compensation per worker, which includes non-wage elements, such as employer and employee social security contributions, so that decoupling is not affected by changes in non-wage compensation. It is deflated using the value added price index. Expressing real wages in terms of consumer prices rather than value added prices would typically imply more decoupling, since consumer prices have grown at a higher rate than producer prices in most OECD countries. Theoretical channels Channels analysed in this paper Source: OECD. Given these data limitations, the labour share analysis summarised below provides descriptive evidence on the role of firms at the technological frontier (that are well covered in available firm-level data) for aggregate labour share developments. The role of the structural and policy drivers in labour share developments is explored directly at the country and industry-levels. The wage inequality analysis mainly focuses on between-firm wage inequality, providing both descriptive evidence on its role for worker-level inequality and econometric evidence on its structural and policy determinants using micro-aggregated data from the OECD MultiProd project.3 Complementary evidence from country-level data directly links aggregate wage inequality to technology, trade and public policies. Technological change and global value chain expansion may impact labour shares and wage inequality in a similar fashion. They may induce capital-labour substitution (the substitution of capital for labour) and reduce the relative demand for low-skilled workers, thereby simultaneously reducing labour shares and pushing up wage inequality 3. See http://www.oecd.org/sti/ind/multiprod.htm and Berlingieri et al. (2017) for more detail about the MultiProd project. (Karabarbounis and Neiman, 2014; Acemoglu and Autor, 2011). By contrast, public policy reforms may have conflicting effects on labour shares and wage inequality. For instance, an increase in the minimum wage likely reduces wage inequality by raising wages at the lower end of the wage distribution, but it may also induce capital-labour substitution, especially if minimum wages are already binding for a large share of workers, thereby reducing the labour share. 4. The primary, housing and non-market sectors account for around 30% of value added in OECD countries. Total-economy labour shares include sectors for which labour shares are largely determined by fluctuations in commodity and asset prices, such as the primary and housing sectors, or for which labour shares are driven by imputation choices, such as the non-market sector. significant wage-productivity decoupling. However, where productivity growth has been around or below the OECD average, such as in Canada, Japan and the United States, decoupling has been associated with near-stagnation of real median wages. In about a third of the covered OECD countries, real median wages have grown at similar or even higher rates than labour productivity. In some countries, such as the Czech Republic or Sweden, this has been associated with above-average real median wage growth, but in some others with below-average productivity growth, including Italy and Spain, real median wages have nonetheless grown at very low rates.  DQGPD\WKHUHIRUHGLIIHUIURP WKRVHLPSOLHGE\WKHUHSRUWHGURXQGHGQXPEHUV)RUPRVWFRXQWULHVGDWDRQUHDOPHGLDQZDJHVDUHQRWDYDLODEOHDIWHULQWKH 2(&'(DUQLQJV'DWDEDVHZKLFKSUHFOXGHVFRYHULQJWKHSHULRG Source : 2(&'1DWLRQDO$FFRXQWVGDWDEDVH2(&'(DUQLQJV'LVWULEXWLRQGDWDEDVH. 5. The decoupling of wages from productivity in frontier firms is unlikely to reflect increases in stock option compensation, as the sample period 2001-13 was characterised by low average stock returns. Song et al. (2015) show that compensation including stock options of top executives in the largest US firms has moved roughly in line with that of other workers in these firms after 1999. 6. The 90-10 percentile ratio of worker-level wages is highly correlated with the ratio of average wages to median wages, i.e. the measure of wage dispersion used in the aggregate analysis. This is consistent with a large body of evidence based on linked employer-employee data suggesting that between-firm wage divergence is a key explanation of wage divergence across individual workers, including for Brazil (Helpman et al., 2017), Denmark (Bagger et al., 2013), Germany (Baumgarten et al., 2016; Card et al.,2013; Goldschmidt and Schmieder, 2015), Italy (Card et al., 2014), Portugal (Card et al., 2016), Sweden (Skans et al., 2009), United Kingdom (Faggio et al., 2010) and the United States (Dunne et al., 2004; Barth et al., 2016; Song et al., 2015). fundamental performance differences across firms that are passed on to wages because of rent sharing. Alternatively, it could reflect the sorting of high-wage workers into high-pay firms and low-wage workers into low-pay ones, which may in turn be related to increased outsourcing. The drivers: Aggregate and disaggregated evidence Technological change Technology-driven declines in investment prices reduce the labour share (Schwellnus et al., 2018). On average across industries, a decline in investment prices relative to value-added prices of 9% – which is around the average decline in relative investment prices observed over the period 1995-2013 in the OECD – reduces the labour share by approximately 1.7 percentage points. This may be due to technological progress h av i n g b e c o m e m o r e l ab o u r d i s p l a c i n g ove r t i m e, w i t h p a r t i c u l a r l y l a rg e labour-displacing effects in the 2000s (Autor and Salomons, 2018). On the one hand, new technology extends the range of existing tasks that can be carried out by machines, thereby displacing workers and reducing the labour share. On the other hand, new technology also creates new tasks that cannot be carried out by machines (Acemoglu and Restrepo, 2018). As the nature of technological progress changes, the balance between labour displacement and task creation from new technologies may shift. In particular, information and communication technologies (ICT) may have shifted the balance towards labour displacement and facilitated the emergence of "superstar" firms with very low labour shares.7 Technological change also appears to contribute to rising wage inequality. With given endowments of low and high-skilled labour (whose stock can be adjusted only slowly over time), technological change can raise wage inequality if it complements high-skilled workers but substitutes for low-skilled workers. Consistent with this hypothesis, the ratio of R&D spending to GDP is positively associated with wage inequality at the aggregate level (De Serres and Schwellnus, 2018) and digitalisation is positively associated with higher wage dispersion between firms (Berlingieri et al., 2017). 7. The result that technology-driven declines in relative investment prices reduce the labour share implies an elasticity of substitution between capital and labour above unity. Although Karabarbounis and Neiman (2014) obtain an elasticity of substitution in the range of 1.2-1.5 in a similar setup as the OECD studies summarised in this chapter, most estimates suggest an elasticity of substitution below one (Chirinko, 2008). The high elasticity of substitution implied by recent OECD studies could partly reflect the recent sample period as the elasticity of substitution between ICT capital that emerged in the 1990s and labour is significantly higher than for other capital goods and is well above unity (Tevlin and Whelan, 2003; Bakhshi et al., 2003). suggests that on average across countries the expansion of global value chains reduced the labour share by 0.6 percentage points. With the caveat that global value chain expansion is unlikely to be independent of technological change (Bloom et al., 2016), quantitatively its effect appears to be only around a third of that from declines in relative investment prices. Trade integration also appears to play a role in increased wage inequality. At the aggregate level, the ratio of median to average wages is negatively associated with value added imports, especially from China (De Serres and Schwellnus, 2018). This could reflect the fact that increased trade integration with China has reduced labour demand more among low-skilled workers than among high-skilled workers (Autor et al., 2015; Autor et al., 2016). Evidence from micro-aggregated data further suggests that betweenfirm wage dispersion increased in sectors that became more open to trade (Berlingieri et al., 2017).8 Overall, the empirical evidence based on a variety of data sources and methodologies consistently suggests that technological change and increased trade integration have contributed to the decoupling of median wages from productivity, both by lowering labour shares and raising wage inequality. This does not imply that technological change and increased trade integration harm workers, since a large body of evidence suggests that these developments raise aggregate productivity, including through efficiency-enhancing reallocation, reduce prices and expand the range of available products (Melitz and Redding, 2014; OECD, 2015). However, it raises the question of how public policies can contribute to the broader sharing of the productivity gains from technological change and increased trade integration. The role of public policies and institutions Public policies play a key role in ensuring that productivity gains from technological change and global value chain expansion are broadly shared with workers. Based on several recent OECD studies, a number of key findings emerge (Table 2.2).9 In particular, enhancing and preserving workersâ&#x20AC;&#x2122; skills is crucial not only for raising productivity growth but also for promoting a broader sharing of productivity gains, both by supporting wages at the bottom of the wage distribution and raising labour shares. By contrast, a number of other policies that tend to raise productivity growth can have conflicting effects on labour shares and wage inequality, with the relative size of these effects likely to depend on initial policy settings. 8. This is in line with existing studies on the role of trade on wage inequality based on matched employer-employee data in individual countries, including Germany and Brazil (Baumgarten et al., 2016; Helpman et al., 2017). 9. Taxes may change the relative price of capital to labour and induce capital-labour substitution. However, recent OECD evidence does not provide clear-cut conclusions on the effects of social security taxes and corporate taxes on the labour share. This is consistent with recent IMF evidence that does not find any effect of corporate taxation on the labour share (IMF, 2017). P P N P P P P "
Labour share declines associated with relative investment price declines are lower in countries and industries with a high share of high-skilled workers (Figure 2.5). Even in a high-routine industry a decline in the relative investment price results in an only modest decline in the labour share if the industry employs a high share of workers with high numeracy or problem-solving skills (Schwellnus et al., 2018). This is likely due to the fact that skills are a key determinant of the substitutability of capital for labour, with higher skills typically found to reduce capital-labour substitutability (Krusell et al., 2000). Competition-friendly product market policies do not only raise productivity but also support the transmission of productivity gains to average wages. The impact of competition-friendly product market reforms on the labour share is a priori ambiguous: while reductions in product market rents appropriated by capital owners tend to raise the labour share, reductions in regulatory barriers to investment could induce capital-labour substitution. However, the empirical results suggest that the upward effect on the labour share of competition-friendly product market reforms through a reduction in mark-ups outweighs the downward effect through capital-labour substitution, so that the labour share increases in response to such reforms. 10. In the short term, increases in minimum wages raise the labour share if the employment response is modest (Card and Krueger, 1994; Neumark et al., 2014), but in the medium term, which is the focus of the studies summarised in this chapter, the increase in minimum wages triggers capital-labour substitution (Lordan and Neumark, 2017). Based on a different country and time sample, Ciminelli et al. (2018) find that the direct positive effect of stricter employment protection on the labour share through higher wages more than offsets the negative effect through capitallabour substitution. protection can reduce the decoupling of real median wage growth from productivity growth by reducing wage dispersion between firms (Berlingieri et al., 2017). The overall impact on decoupling from raising minimum wages or tightening employment protection is likely to depend on their initial levels. Where initial levels of minimum wages are low and employment protection for some workers is weak, adverse effects on the broad sharing of productivity gains from capital-labour substitution may be more than offset by reductions in wage inequality. Strengthening workers' bargaining positions through reviewing collective bargaining institutions can promote the transmission of productivity gains to wages. On average across countries, some degree of centralisation of collective bargaining does not appear to reduce the labour share and may reduce between-firm wage dispersion (Berlingieri et al., 2017).11 In contrast to minimum wages and employment protection rules which are often set at a single level across industries, centralised collective bargaining typically takes place at the industry level, which may allow workers to appropriate industry-specific rents with minimal impact on capital-labour substitution. A downside of centralised collective bargaining is reduced flexibility in wage setting for individual firms, which may reduce long-run productivity growth. Indeed, the evidence suggests that more centralised bargaining is associated with a weaker link between productivity and wage dispersion, which could reduce workers’ incentives to move to high-productivity firms (Berlingieri et al., 2017). Balancing the beneficial effects of more centralised collective bargaining on the sharing of productivity gains with possibly detrimental effects on long-run productivity growth will require combining centralised industry-level bargaining with some elements of decentralisation, for instance by providing the possibility of controlled opt-outs or allowing explicitly for further adaptation at the firm or individual levels (Carluccio et al., 2015; OECD, 2018). Promoting the re-employment of workers who lose their jobs through active labour market policies can raise the labour share and support the transmission of productivity gains to wages. Recent OECD analysis suggests that active labour market policies that provide job search assistance to workers with relevant skills and provide training opportunities and work-experience programmes for the least employable promote the transmission of technology- and globalisation-driven productivity gains to wages (Schwellnus et al., 2018). References Acemoglu, D. and D. Autor (2011), “Skills, Tasks and Technologies: Implications for Employment and Earnings”, D. Carol and O. Ashenfelter (eds. ), Handbook of Labor Economics, Vol. 4B, 1043-1171. Acemoglu, D. and P. Restrepo (2018), “Artificial Intelligence, Automation and Work”, NBER Working Paper, No. 24196, National Bureau of Economic Research, Cambridge, MA. Andrews, D., C. Criscuolo and P. Gal (2016), “The Best versus the Rest: The Global Productivity Slowdown, Divergence across Firms and the Role of Public Policy”, OECD Productivity Working Papers, No. 5, OECD Publishing, Paris. Autor, D., D. Dorn and G. Hanson (2015), “Untangling Trade and Technology: Evidence from Local Labour Markets”, Economic Journal, 125, 621-646. 11. The result that the centralisation of collective bargaining reduces wage inequality is consistent with evidence from other studies suggesting that it weakens the bargaining position of high-skilled workers (Dahl et al., 2013; Leonardi et al., 2015). Autor, D., D. Dorn and G. Hanson (2016), “The China Shock: Learning from Labor-Market Adjustment to Large Changes in Trade”, Annual Review of Economics, 8, 205-240. Autor, D. et al. (2017), “Concentrating on the Fall of the Labor Share”, NBER Working Paper, No. 23108, National Bureau of Economic Research, Cambridge, MA. Autor, D. and A. Salomons (2018), “Is Automation Labor-Displacing? Productivity Growth, Employment, and the Labor Share”, Brookings Papers on Economic Activity Conference Drafts. Bagger, J., K. Sørensen and R. Vejlin (2013), “Wage Sorting Trends”, Economics Letters, 118/1, 63-67. Bakhshi, H., N. Oulton and J. Thompson (2003), “Modelling Investment When Relative Prices are Trending: Theory and Evidence for the United Kingdom”, Bank of England Working Papers, No. 189. Barth, E. et al. (2016), “It’s Where You Work: Increases in the Dispersion of Earnings Across Establishments and Individuals in the United States”, Journal of Labor Economics, 34/S2, S67-S97. Baumgarten, D., G. Felbermayr and S. Lehwald (2016), “Dissecting Between-Plant and Within-Plant Wage Dispersion: Evidence from Germany”, Ifo Working Paper, No. 216, Ifo Institute – Leibniz Institute for Economic Research at the University of Munich. Berlingieri, G., P. Blanchenay and C. Criscuolo (2017), “The Great Divergence(s)”, OECD Science, Technology and Industry Policy Papers, No. 39, OECD Publishing, Paris. Bivens, J. and L. Mishel (2015), “Understanding the Historic Divergence Between Productivity and a Typical Worker’s Pay: Why It Matters and Why It’s Real”, Briefing Paper, No. 406, Economic Policy Institute. Bloom, N., M. Draca and J. van Reenen (2016), “Trade Induced Technical Change? The Impact of Chinese Imports on Innovation, IT and Productivity”, Review of Economic Studies, 83/1, 87-117. Braconier, H. and J. Ruiz-Valenzuela (2014), “Gross Earning Inequalities in OECD Countries and Major Non-Member Economies: Determinants and Future Scenarios”, OECD Economics Department Working Papers, No. 1139, OECD Publishing, Paris. Bridgman, B. (2014), “Is Labor's Loss Capital's Gain? Gross versus Net Labor Shares”, Bureau of Economic Analysis. Calligaris, S., C. Criscuolo and L. Marcolin (2018), “Mark-ups in the Digital Era”, OECD Science, Technology and Industry Working Papers, No. 2018/10, OECD Publishing, Paris. Card, D., A. Cardoso and P. Kline (2016), “Bargaining, Sorting, and the Gender Wage Gap: Quantifying the Impact of Firms on the Relative Pay of Women”, Quarterly Journal of Economics, 131/2, 633-686. Card, D., F. Devicienti and A. Maida (2014), “Rent-sharing, Holdup, and Wages: Evidence from Matched Panel Data”, Review of Economic Studies, 81/1, 84-111. Card, D., J. Heining and P. Kline (2013), “Workplace Heterogeneity and the Rise of West German Wage Inequality”, Quarterly Journal of Economics, 128/3, 967-1015. Card, D. and A. Krueger (1994), “Minimum Wages and Employment: A Case Study of the Fast-Food Industry in New Jersey and Pennsylvania”, American Economic Review, 84/4, 772-793. Carluccio, J., D. Fougère and E. Gautier (2015), “Trade, Wages and Collective Bargaining: Evidence from France”, Economic Journal, 125/584, 803-837. Chirinko, R. (2008), “The Long and Short of It”, Journal of Macroeconomics, 30/2, 671-686. Cho, T., S. Hwang and P. Schreyer (2017), “Has the Labour Share Declined? : It Depends”, OECD Statistics Working Papers, No. 2017/1, OECD Publishing, Paris. Ciminelli, G., R. Duval and D. Furceri (2018), “Employment Protection Deregulation and Labor Shares in Advanced Economies”, IMF Working Paper No. 18/186, International Monetary Fund, Washington D.C. Dahl, C., D. le Maire and J. Munch (2013), “Wage Dispersion and Decentralization of Wage Bargaining”, Journal of Labor Economics, 31/3, 501-533. De Serres, A. and C. Schwellnus (2018), “A General Equilibrium (LM and PM reforms) Perspective to Inequality”, in C. Astarita and G. D’Adamo (eds. ), Inequality and Structural Reforms: Methodological Concerns and Lessons from Policy. Workshop Proceedings, European Economy Discussion Papers No. 71, European Commission, Brussels. Dunne, T. et al. (2004), “Wage and Productivity Dispersion in United States Manufacturing: The Role of Computer Investment of the Census”, Journal of Labor Economics, 22/2, 397-429. Faggio, G., K. Salvanes and J. van Reenen (2010), “The Evolution of Inequality in Productivity and Wages: Panel Data Evidence”, Industrial and Corporate Change, Vol. 19/6, pp. 1919-1951. Goldschmidt, D. and J. Schmieder (2015), “The Rise of Domestic Outsourcing and the Evolution of the German Wage Structure”, NBER Working Paper, No. 21366, National Bureau of Economic Research, Cambridge, MA. Helpman, E. et al. (2017), “Trade and Inequality: From Theory to Estimation”, Review of Economic Studies, 84, 357-405. IMF (2017), “Chapter 3 : Understanding the Downward Trend in Labor Income Shares”, in World Economic Outlook, April 2017: Gaining Momentum?, International Monetary Fund, Washington D.C. Karabarbounis, L. and B. Neiman (2014), “The Global Decline of the Labor Share”, Quarterly Journal of Economics, 129/1, 61-103. Krusell, P. et al. (2000), “Capital-Skill Complementarity and Inequality: A Macroeconomic Analysis”, Econometrica, 68/5, 1029-1053. Leonardi, M., M. Pellizzari and D. Tabasso (2015), “Wage Compression Within the Firm”, CEPR Discussion Paper Series, No. 10770. Lordan, G. and D. Neumark (2017), “People Versus Machines: The Impact of Minimum Wages on Automatable Jobs”, NBER Working Paper, No. 23667, National Bureau of Economic Research, Cambridge, MA. Melitz, M. and S. Redding (2014), “Heterogeneous Firms and Trade”, G. Gopinath, E. Helpman and K Rogoff (eds. ), Handbook of International Economics, Vol. 4, 1-54. Neumark, D., J. Salas and W. Wascher (2014), “Revisiting the Minimum Wage-Employment Debate: Throwing Out the Baby with the Bathwater?”, Industrial & Labor Relations Review, 67/Supplement, 608-648. 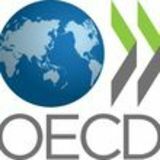 OECD (2015), The Future of Productivity, OECD Publishing, Paris. Pak, M. and C. Schwellnus (2018), “Labour Share Developments Over the Past Two Decades: The Role of Public Policies”, OECD Economics Department Working Papers, OECD Publishing, forthcoming. Pessoa, J. and J. 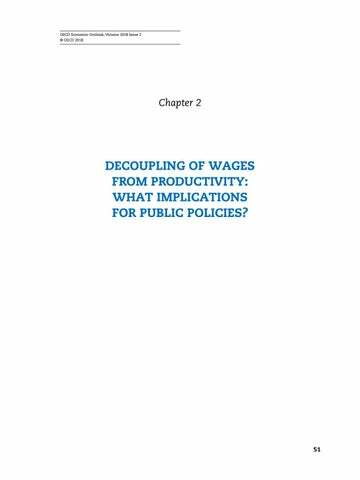 Van Reenen (2013), “Decoupling of Wage Growth and Productivity Growth? Myth and Reality”, CEP Discussion Paper, No. 1246. Philippon, T. (2018), A Primer On Concentration, Investment and Growth. Rognlie, M. (2015), “Deciphering the Fall and Rise in the Net Capital Share: Accumulation or Scarcity?”, Brookings Papers on Economic Activity, Spring 2015, 1-54. Schwellnus, C., A. Kappeler and P. Pionnier (2017), “The Decoupling of Median Wages from Productivity in OECD Countries”, International Productivity Monitor, 32, 44-60. Schwellnus, C. et al. (2018), “Labour Share Developments Over the Past Two Decades: The Role of Technological Progress, Globalisation and “Winner-Takes-Most” Dynamics”, OECD Economics Department Working Papers, No. 1503, OECD Publishing, Paris. Sharpe, A. and J. Uguccioni (2017), “Decomposing the Productivity-Wage Nexus in Selected OECD Countries, 1986-2013”, International Productivity Monitor, 32, 25-43. Skans, O., P. Edin and B. Holmlund (2009), “Wage Dispersion Between and Within Plants: Sweden 1985-2000”, in E. Lazear and K. Shaw (eds. ), The Structure of Wages: An International Comparison, University of Chicago Press. Song, J. et al. (2015), “Firming Up Inequality”, NBER Working Paper, No. 21199, National Bureau of Economic Research, Cambridge, MA. Tevlin, S. and K. Whelan (2003), “Explaining the Investment Boom of the 1990s”, Journal of Money, Credit and Banking, 35/1, 1-22. van Reenen, J. (2018), Increasing Differences between firms: Market Power and the Macro-Economy.